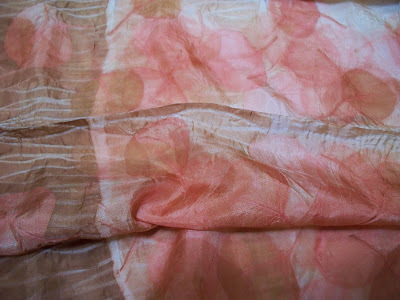 We finally got a chance to open our bundles from the eco dyeing/printing workshop. 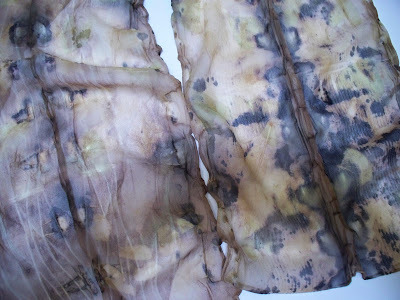 This method of dyeing is not for those who demand instant gratification. We took the workshop over a month ago!! But look at some of the results. Several of my pieces were okay; not bad but not great. But there were a couple I’m extremely pleased with and they happen to both be on wearable items-scarves, not just pieces of cloth. The scarf above was done with loquat leaves, rose petals and violet leaves. This little beauty was done with eucalyptus leaves. What a great color when a bit of vinegar is part of the process. 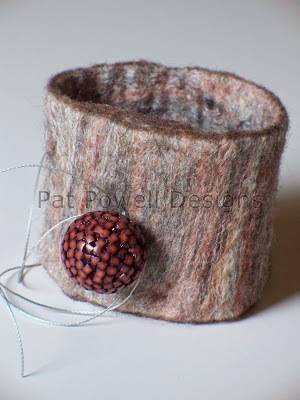 This month’s felting group activity was a bracelet. One of our members found a cute idea which had a length of wire contained in the felt with the ends of the wire protruding at the ends. 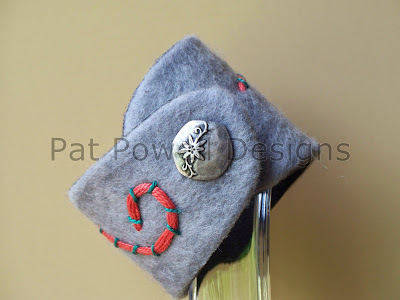 The wire in the felt helped give the bracelet shape and the wire at the ends could be used as embellishment. As seen in my sample there is no wire protruding at the ends. 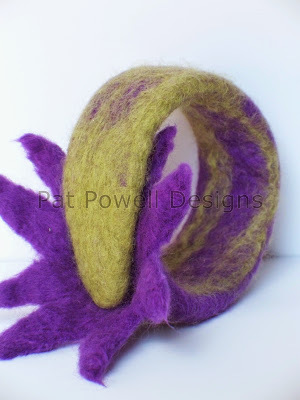 Rather there is a great deal of felt extending past the wire! 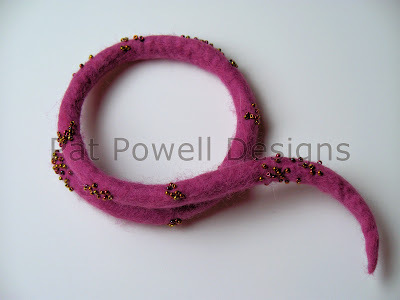 Not to let that deter me, I shaped both the wire and the felt to give me a very interesting bracelet. Of course, it also needed some beads to add even more interest. I do like the way the bracelet turned out but need to spend a little time doing the project as it was intended. Looking forward to next month’s group activity. 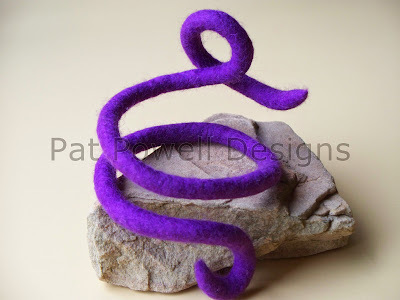 At last month’s felt study group, we talked about what techniques we would be interested in exploring. A couple of the items mentioned were flowers and bracelets. One evening as I was settling in for some sleep I thought about what would happen if both those items were combined. So here I have my first interpretation of that idea. I think it turned out interesting enough to continue pursuing.